Check out this video to see how to build a very simple and inexpensive trellis for any size raised bed garden. Using some scrap wood that I already had I was able to keep the cost of each of these below $1. These are great for growing peas, cucumbers, pole beans, or any other vining crop. In our case we have six 6' X3' raised bed garden boxes that were made from free pallet wood. I choose to run a trellis down the long side of each box so that I could maximize the amount of climbing crops I could grow. Our family loves pickles and peas so that will be the main use for them this year. This is also the best angle for the sun so that as the vining crops get bigger they will not block out the smaller crops in the box below. I started by cutting 3 2X4's into 6' pieces and 6 2X4's into 45" pieces. This will make the trellis about 48" tall from the height of the dirt but you can make them shorter or taller of course. Next I ripped down the 2X4's into 1 3/4" wide strips (cutting each one in half long ways). 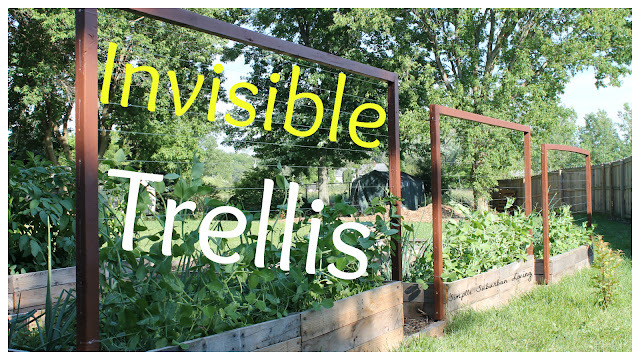 At this point you have made all the cuts that you need for six trellis's. There are many different ways to connect the frames together but I choose to use a half-lap joint in this case. this will be the strongest joint that will withstand the wind and weight of the fruit hanging in the wind here in Michigan. I used a circular saw to cut each joint down 3/4" by making several close cuts at the ends of each board. I then chiseled out that area until it was fairly flat. These don't have to be perfect and if you mess up a bit you can always sand them flat once they are secured together. Check out the video for more details on this step. Next I overlapped the half-lap joints and pre-drilled some holes making sure things were square before I drilled. Wood glue is used to secure the joints together along with some 1" wood screws. Once the glue has dried you can get them painted with whatever color you would like. I recommend using a deck stain or other sealer so that they withstand the weather. At this point you are ready to secure them to the ends of your raised beds. 2 1/2" deck screws were used (2 in each leg) to secure them to the boxes. Next, make a mark every 3" starting at the top and working your way to the bottom on the outside of each leg. Using whatever size drill bit you have around (I always break my small ones) drill a hole at each mark at least big enough to get the fishing line through. I am using 60 lb. test single filament for this step but you can use whatever size and strength line you would like. You can also use string or any other type of cord here if you would like. I chose fishing line since it is clear it makes them almost invisible during the off season when nothing is growing on them. Start feeding the line through from the bottom hole and work your way up to the top using one single piece of line for each trellis. If you prefer you can also use one piece for each run back and forth but I chose for less hassle and just weaved the single line back and forth through each hole until I was at the top. Tie it off and the ends or tie a knot so that it cannot slip back through and you are done. This trellis should be long lasting, stand up to the elements, and look a bit nicer than the standard lattice that you could pick up at the store. Plus, these look much nicer when nothing is growing on them which for us up here in Michigan, is most of the year!